Update: Thanks for all the comments! In the end, I put forth the cream Alberta Ferretti dress and the blue Carmen Marc Valvo dress for the vote. Rest assure, we are going to get the one we choose made in a champagne color that will not clash with the bride’s. We haven’t done the vote yet, but the competition looks tough. There are some pretty strong competitions from styles that the other bridesmaid’s have posted. I shall keep you updated on the progress! Marriage has always been something I’ve thought of in the distant future. But maybe it isn’t so distant after all. Recently, people I know just keep on getting engaged! The first one to tie the knot, is my high school friend C, whom I’ve known since we were 12. HG and I are going to be part of her bridal party in October. One of our first tasks, is to come up with bridesmaid dresses. To compliment all body shapes, I thought that maybe this very simple and demure dress by Alberta Ferretti might be a good option. Though I do worry that it might turn out matronly. Ok, this red Armani is a bit va va voom. 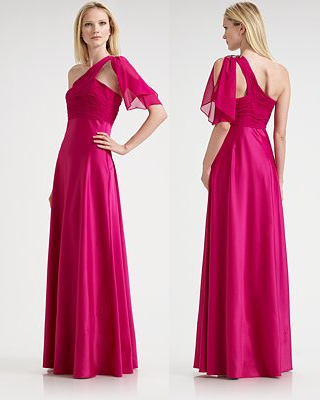 But I was thinking maybe something similar, (in our color of course) with a less v neckline? Being quite flat-chested myself, I’m not a fan of strapless dresses (I worry that it might fall off and I won’t even notice!). Thinking outside of the box, I thought, why not one shoulder gowns? They are trendy right now, and they won’t fall off! I’m loving this elegant one shoulder dress from Carmen Marc Valvo. But then this one by Theia is so pretty too- especially the flower! And what about this one from Aidan Mattox? The neckline is like a half halter and the sleeves is kind of interesting. I can only recommend 2 of these dresses above to the bridal party as my choices. The question is, which one? Let’s do a preliminary round of votes here first! I actually really like the first (although you have to be careful as it is close to wedding colour!). I really really like how elegant and timeless that piece is. I LOVE the last one, I agree with you about the sleeve. The blue dress is gorgeous! I do like the asymmetric designs. I think the first design is very elegant and I like the last two ones also. cute and unique. I think the one-shoulder is the right way to go. The Carmen Marc Valvo and the Theia get my votes! The draping is well done on both of them, and the flower on the Theia is definitely a bonus. red armani or the first blue off the shoulder one, simple yet elegant enough that everyone will love them! I like the Carmen Marc Valvo and the Armani! Both are very flattering dresses and i think that the cut of both would look elegant most body types 🙂 They are also understated and wont draw a lot of attention away from the bride. I feel that while the Aidden Mattox is very cute, you want to have the dresses as simple as possible so that the bride can be the one “Wow-ing” her audience! On first glance the Carmen Mark Valvo immediately caught my eye it is an utterly breathtaking gown. 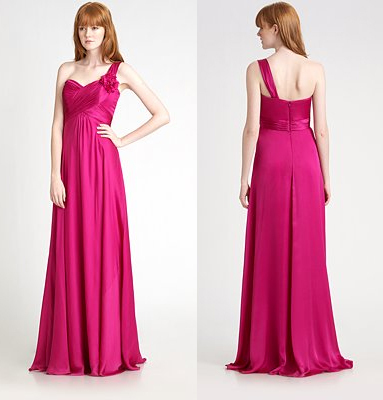 but then the Aidon Mattox just has that little shoulder detail that, to me, adds a little romance? 🙂 Best advice is to try them all on and im sure you will know immediately. I was a bridesmaid at my sisters wedding so I know what a job it is! Would love to hear what you eventually decide. Check this one shoulder dress. It comes in 21 colors and I find it to be on track with what you are looking for. Enjoy! Magnificent dresses! A blue dress especially elegant.